They were collecting rainwater at the Ramat Rahel gardens 2,500 years ago. You can too. Connect your rain barrel to a Larry Hall rain gutter sub-irrigation system and you'll have a super efficient and productive vegetable garden that will rival the ancients. Introduces the 59" RainSaucer™ and shows you how into install it on a Rain Barrel. Collect 10 gallons per inch of rain. 5 minute install with no tools required. Food safe surface means water is caught in a clean way. Aha, rainwater harvesting and underground channels, tunnels and gutters. Could they have been sub-irrigating their plants? It looks like a very strong possibility. One of the unique features of Ramat Rahel's garden is its advanced irrigation system. The scope of the garden is even more impressive, says Dr. Gadot, because there was no permanent water source at the site. Rainwater was efficiently collected and distributed throughout the garden with aesthetic water installations that included pools, underground channels, tunnels, and gutters. Rainwater Harvesting » What Kind of Roof is Safest for Potable Water? Here's more on science Sunday. Many of you have probably been patiently waiting for the results of this study. Read on and also visit the Yahoo group linked above to meet more rainy day harvesters. Connie Shelley of Shelley's Nursery & Garden Center now understands the very significant benefits of rainwater harvesting and sub-irrigation instead of overhead, or top watering. Smart woman. She knows that it is never too late to learn something new. We have a large group of NYC horticultural obstructionists who could learn from her. There is really no significant difference in growing vegetables or flowering planters. The basic principals of sub-irrigation are essentially the same and so are the significant benefits. "In the long run (with the new technology), we'll save on water. It's a lot more environmentally friendly and healthier, and our plants will be healthier," nursery owner Connie Shelley said. "We decided to take that plunge, and I don't think we're going to be sorry about it because our customers absolutely love it." And the plants love it too! "These plants have deep root systems because this (way of watering) pulls the roots down, and when your root system is pulled down instead of up from top watering where the roots have to come up to get the water, then you have a nice, strong, anchoring root system that will take in nutrition better, and you have a stronger plant," Shelley said. WAVERLY, OH -- While the large volume of rain this spring has been an inconvenience for some, it's been a true source of cost savings for an area nursery. Harvesting the rainwater for use and reuse is one of the ways a new greenhouse -- the "green greenhouse" -- constructed at Shelley's Nursery & Garden Center is using environmentally friendly technology to cut operating costs and improve product quality. If we had better consumer education about sub-irrigated portable micro gardens and rainwater harvesting this would be a common sight on row-house rooftops in cities across America. These happen to be EarthBox type sub-irrigated planters. The water is harvested in recycled olive barrels from the Great American Rain Barrel Company. What do a radio station and vegetables have in common? They both share space with EarthBoxes! At Radio Newport, Rhode Island, fresh vegetables sprout on the roof -- in EarthBoxes. Radio station directors Steve and Alexandra Cerilli converted the flat, rubber roof of their offices into an EarthBox container garden several years ago. This is a rooftop garden that was entered in an Apartment Therapy contest. The entry is about a DIY rainwater harvesting system but what caught my eye was the planter box garden. More than likely the planter boxes (raised beds) are watered by drip irrigation or hose watering. You can see a hose in the walk space between the planters. What is little understood in the gardening world is that sub-irrigation is a much better way to irrigate these boxes. There are many books and blogs about top watered raised beds but little about sub-irrigated beds or wicking beds. It appears that the boxes are lined. In any case they should be lined with sheet plastic and a raised bottom created to hold water. A wicking system would then move the water up by capillary action. This method provides the ultimate in even moisture on a consistent basis. Plants thrive on this with the result that vegetable productivity may be as much as doubled, at the same time using much less water. One of the goals of the Center for Urban Greenscaping will be to test various systems of sub-irrigation with the goal of finding the most productive and easiest to build. These two videos from the Wall Street Journal illustrate a point. 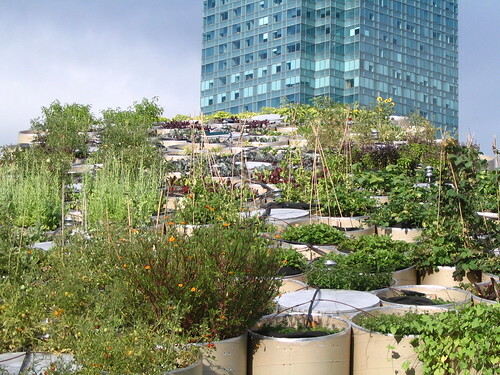 The green roof video is all about water runoff and nothing about food production. The types of roofs they’re talking about are referred to as “extensive” green roofs. These are typically a shallow layer of low maintenance sedum (succulent) plants. A container garden type green roof is called an “intensive” green roof. If you can keep these two green roof terms straight in your mind, you have a better memory than I. We need more easily understood and memorable terms for these roofs. More importantly, we need a new focus on a higher goal of green roofs to include food production. This is a rain barrel with a removable lid that is a sub-irrigation (self-watering) planter. Why not? There isn't a detailed description in this article but that looks like a rope wick coming out of the hole in the middle of the planter lid. There isn't a photo with a plant installed but it certainly is a creative way to decorate a utilitarian rain barrel. You could have a rain barrel that looks like this. I like it a lot better than this one. What the city of Lexington, Kentucky is calling the "Lily" is available only to residents for $75. The Lily was designed by two local residents who call it the Raintainer. Whether it will be available on the consumer market remains to be seen. Michael Pollan spoke at P.S.1 site of Public Farm 1 last evening. I took a series of photos before his lecture. They are posted to a set on Flickr. Public Farm 1 is the name of the summer season edible garden installed in the courtyard of P.S.1 an affiliate of The Museum of Modern Art. Work AC, a New York architectural firm, won this annual Young Architects Program competition. They now have a most informative website that details how the project evolved. Have a look at this time-lapse video and watch the garden come to life in a matter of minutes. I picked a bad time to visit on a Saturday evening. There was a party at the museum, it was packed and the music was loud. I’ll go back on a weekday and take some pictures when things will be quieter. In looking at the planter construction, this was obviously a missed opportunity to employ sub-irrigation. Thanks to our ultraconservative horticultural educators, the architectural and design community is largely unaware of the “green” benefits of sub-irrigated planters. I have no doubt that sub-irrigation would be saving water and producing a higher vegetable yield in this unique urban agriculture project.